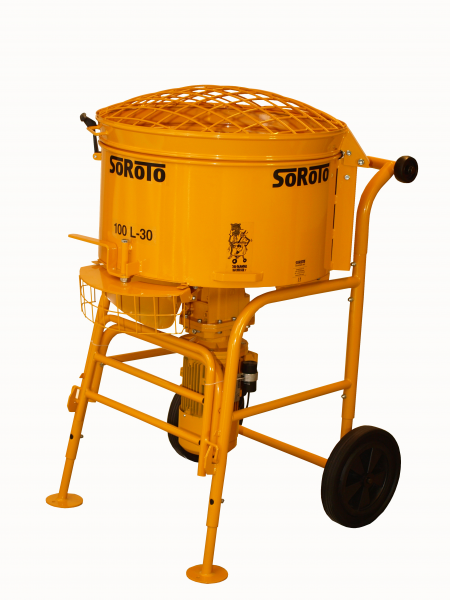 The SoRoTo 100-L is the best choice if you wish to mix large quantities of material. Where traditional paddle mixers only reach the doorway, the SoRoTo Mixer rolls easily through doors. You can take the flexible SoRoTo Mixer with you anywhere you like. There’s no need to do it the hard way and carry mixing materials to remote corners – SoRoTo’s right on the spot. The SoRoTo 100-L with its specialised paddles can mix all materials from sand and cement to self-level epoxies. 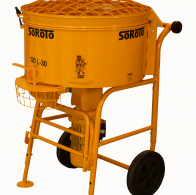 The SoRoTo Mixer is easy to transport and to handle. It runs on single phase voltage (110/240 Volts) and weighs only 98 kg. Advantages not to be ignored! Removable paddles for ease of cleaning, without using tools. After 3-5 minutes the perfect mix is discharged through chute at bottom of drum. The charging hopper is mounted on hinges and equipped with automatic mechanical switch to meet safety regulations.